In good times and in bad, training, learning, and improvement should be the last thing cut from our individual “To Do” lists. There’s a lot at stake. Think about it: There are new ideas out there, best practices that can make our libraries better. Have you taken the time to read about them? There are improved and more efficient ways to serve our changing customers and communities, with evidence based on research and facts. Do you know about them? Technology keeps marching on, offering modern alternatives to improve our services. Have you paused to consider the value of blogging or going wireless? Please don’t say you still use pencil and paper schedules! As you plow through the chaos each morning, do you give much thought to your own career? Remember the concept of a career? It’s what happens in the 30 years between graduation and retirement, and in the end it’s supposed to resemble something that you intended to happen. Imagine a golfer, being interviewed after blowing a big tournament. Asked if he plans to work with his coach or add some practice time, he replies “Can’t! No time! My schedule is full, so I’m just going to keep doing what I did today!” How about doctors? How confident would you be before your heart surgery if your doctor admitted she hadn’t been to a class or conference in years? And who would take their car to a mechanic who hadn’t learned a thing since he worked on his ’66 Karmann Ghia? So what makes it okay to ignore your own growth and improvement? Invest in yourself. Lose the excuses. The good news is, without any money and with very little time—but a lot of commitment—you can build your skills, improve your performance, and enhance your opportunities, while still doing your day job well. If you focus your learning effectively, you’ll actually get better at what you do, and you’ll be growing professionally in the direction you have intentionally chosen. In Be a Great Boss, a one-year-development book that will be published this summer, I suggest that using a structured training program is the best approach. The good news here is that you can design it yourself. The most important thing you need to make it work? One hour a week. That’s not much time, really, when you consider what the benefits might be. You can sharpen your skills. You can enhance your performance. Ultimately, you can affect your library, your coworkers, and your customers more than by being stuck to a knee-jerk, nose-to-the-grindstone approach that’s oblivious to improvement. Let’s be honest, most of us waste at least one hour each week, intentionally or unintentionally, if we’re willing to admit it. If you absolutely cannot carve one hour out of your current workload, then donate it from your own time. Work through a lunch. Get up early. Stay up late. The argument that you’d be working off the books doesn’t hold water here because, remember, this is your career we’re talking about. If you won’t invest in it, who will? If you’re on board by now, you’re probably wondering how to get started. You have a couple of choices here. If you would like to forego the planning steps, you could be spontaneous with your time and select your topic impulsively each week. What’s been keeping you up at night? Are you struggling with budgeting? Find some best practice reports online. Dust off that article you set aside a few months ago to read. Draw up a planning calendar to develop your budget with more staff input in the process. What about hiring? Are you asking the same old questions over and over again and watching the evolution of a Stepford staff? Try creating an innovative new interview. Find some great behavioral questions online. 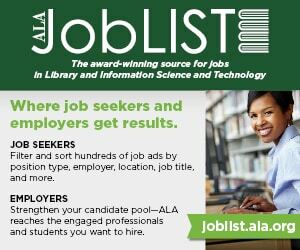 Find some intriguing new library job descriptions in the journal classifieds. Could any of them serve your staff well? 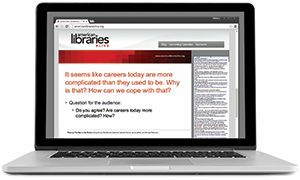 Set some time aside to talk to colleagues who are on the cutting edge and get some advice. wouldn’t ultimately offer you deep, significant, and lasting growth. Better than spontaneity, I would suggest, you need a plan. Be a Great Boss is just such a plan, designed for people thrust into leadership positions for which they weren’t necessarily ready. The book is an example of a focused learning program to create growth in one particular area. It outlines topics to cover, support materials to read, and exercises to be completed. Do you know your learning needs? Before you get started, you’re going to have to figure that part out and come up with a plan. You have the intention to improve; now you just need the strategy. Whether you use a workbook like Be a Great Boss, take an online course, or design something yourself, you need to move forward with a focus. What’s your plan for the rest of the day? What’s on the slate? Do you have other meetings this afternoon? What about tomorrow? The next day? What’s the one biggest thing you hope to accomplish at work, at least before the week is over? How about sometime this year? What has to happen for you to be successful? What can you do to help that happen? What we’re talking about here is having a strategy. Chances are your library has a strategic plan someplace. Look around. Top shelf, maybe, way back, behind the microwave-oatmeal packets? If you’re lucky, your library not only has a plan but also uses it. With a plan, success is more likely; after all, if you don’t know where you’re going, how will you know when you get there? And action needs to be planned. When you think about your mission, you should be seeing the big picture of what you want to do in your working lifetime. You’re not going to jump from wanting to make an impact in public libraries to wanting to become a concert pianist. While surely your mission can bend a bit, it should unwaveringly move you closer, year by year, to the person you want to become and to achieving the professional contribution you want to make. One of the most damaging things that can happen to any boss’s productivity, initiative, and, most basically, attitude is to allow herself to move into a mission-ignore phase of her career. Unlike the perhaps better known issue of mission creep, where targets are constantly changing, this individual shortcoming is usually brought about by a combination of lack of attention, frustration, or even fear of the unknown. Throughout your career, you’ll likely be faced with many decisions, with many bumps in the road, around which you’ll have to navigate, and with many roadblocks at worst or speed bumps at best. There’s an easy way to stay on course when this happens: Have a career strategy and stick to it. Always know your career’s mission. Clarify it. Post it on your printer or carry it in your purse or wallet. Look at it every five years or so and make sure it still makes you smile or intrigues you. From that mission, make all of your other career decisions. Start each year by naming at least two or three accomplishments you want to achieve before New Year’s Eve. Then spend some time with those ideas. Spend enough time that you’re excited about them. Stop before you get jaded by them. Make a plan to achieve the goals you’ve set. Write it down somewhere. Show it to someone. There are probably several smaller steps you can take to help you achieve the accomplishments you’ve identified. Every three months or so, do a spot check to see where you are in your progress. Then, when the year wraps up, find out why you fell short in some areas. If those goals are still important, learn from the previous year and make the next one better. Your goals should change a bit from year to year, depending both on what’s available for you to do and what’s happening in the professional marketplace and in your own library. Did your boss change? Then perhaps you’ll have to rearrange your goals. That’s okay, though, as long as you stick to your overall career mission. So at the end of each year, when you’re cleaning out your files, maybe writing evaluations, or just setting up your new calendar, add this one critical step in your own strategic career development: Set your professional goals for the coming year again. Pull out your career mission statement and check to see that your goals are still aligned correctly, and then you can start making plans to implement your strategy with all options available to you today—and tomorrow. Don’t forget to check in at least quarterly throughout the year. Whether you can tell statistically that you’ve accomplished something or whether you need a much less empirical measurement to be sure, you have to stop and check. Measure where you are. Measure your progress and celebrate your successes all along the way. In that way, year 10 will look better than year 5 and year 20 will feel great compared to year 12; and so on, right up to your carefully calculated last day. The next logical step, then, is to identify and invest in your goals. Think about them and pick the one you’d like to grow the most in during the coming months. If you take the time up front to create a development plan around a goal, you’ll find the investment in time and learning will more directly get you where you want to go. When you finish your training plan, re-examine your goals. Adapt them, as necessary, and outline the next training program that will help you support them. You’ll be making progress and moving in the right direction, rather than playing “hit and miss” with whatever today’s emergency issue happens to be. What’s the payoff? As an answer, I ask you to picture the new boss out there who was recently promoted into a leadership position for which she was neither trained nor ready. Oh, there’s so much to learn and to do. She can either dive in, dedicating every minute of her days to dog-paddling just to stay afloat; or she can decide to improve at the job, while she’s getting her work done. After a full year, she’ll undoubtedly have accomplished a lot. Maybe she’ll have straightened out the collection mess, re-established networks within the community, solved some staffing issues, or perhaps even brought in a grant. But what else could have happened if she’d also been dedicated to ongoing development? Stronger skills? New ideas? Creative options? Less frustration? Maybe even a better second year? An investment in yourself to always keep learning and growing will pay off again and again, with benefits affecting your coworkers, your staff, your customers, your library, and, ultimately, your career. Especially in these changing and challenging times, we can’t be too busy to get better. CATHERINE HAKALA-AUSPERK is a graduate of Kent State University and a 25-year public library veteran. She currently serves as deputy director of the Cleveland Heights–University Heights (Ohio) Public Library. Her book Be a Great Boss will be published by ALA Editions this summer.